GBA Kuru Kuru Kururin (Europe) in 06:11.59 by mohoc & E-Sh4rk. Kuru Kuru Kururin is an unusual game that is a mix of racing/puzzle genres. 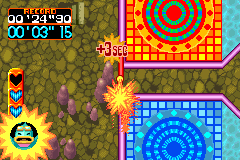 The player controls a slowly spinning stick called the Helirin, and must maneuver it through a series of mazes. The player controls the direction and speed of movement but not the Helirin's constant rotation. mohoc and E-Sh4rk improve the previous movie by 4 minutes and 10.49 seconds, thanks to the discovery of wall clipping and out of bounds goal zones. Please read the authors' comments for more details. Of note that this TAS also plays the training stages, whilst Ryuto's TAS did not. There is also a run of the sequel, Kururin Paradise. The second set of encodes feature a camhack, where the camera is centered at the Helirin, as well as displaying the OoB elements.